Getting tired of making small batches of french press coffee over and over? Having a big french press in your arsenal can be super handy. After having company over a few years back I quickly realized how annoying it was to only have a single serve french press. Making coffee for my guests was a never ending process. The solution however was simple, I got myself a large French press that I pretty much only reserve for special occasions and I’ve never been happier. Most large capacity cafetieres make 51 ounces of coffee. Although it would be nice to have a 64 oz french press they just aren’t made by major coffee equipment brands. The biggest press pot I know of is this 1.75 liter (59 oz) insulated french press by Sterling Pro. It’s actually one of the best options available too because it’s an insulated stainless steel model. Of course for people that just want to have a big french press on hand for occasional use then a cheaper glass model like the 51oz Grosche Madrid or the 51oz Bodum Brazil. If you find yourself in need of an extra french press then read on, there is a lot to say about these coffee makers and you shouldn’t only shop based on sheer size or pricing without considering the quality or value. In this article I have listed out six of the biggest options on the market (and the best large presses) and provided brief review summaries of each to help you narrow down your search. So, let’s check out the largest models that are available in the market and see which one is the best buy for you! It’s crazy simple to find 12 cup french press coffee makers, every major brand makes them. It is hard however to know what the difference is between them and that’s where GBC comes in. There are big differences between these pots and some of them are better values than others. The main points of differentiation is quality of insulation (if any), quality of the filter screen, product durability, and materials used. You can jump to our Buyer’s Guide below to learn more about our thoughts on these points if you like or just scroll down to our reviews of your best options. As is usually the case it’s best to buy the best product that you can comfortably afford. Lets start with the best value option. The Sterling Pro is probably the best french press you can buy without paying a lot more for a premium model. Sterling Pro french presses are double wall vacuum insulated so they retain their heat very well throughout the brewing process giving you better temperature control and flavor extraction from the grind. The body and plunger of this coffee press are all made from stainless steel… meaning there is not plastic of any kind in this coffee maker. In fact we’ve also placed this model on our list of our favorite plastic free coffee makers. We think you’ll also get a cleaner cup of coffee with this model because the filter screen is twice as thick. There are two layers of screening which help keep grind from escaping up the sidewalls of the beaker while you press the plunger down. So, at the end of the day, all these features make this 1.745 L (59 oz) French press worth it. Don’t get me wrong, there are better french press options to choose from but not at this price point. You can see pricing on the 12-cup Sterling Pro right here. Another company that’s really famous when it comes to French presses is Bodum. In fact, Bodum is one of the oldest and most reputable companies out there, with quite a lot of unique products. Most people know Bodum as a household name and think of them first when they think of the french press. This model, the Bodum BRAZIL Coffee Maker, is one of their best selling models based mainly on pricing alone. It is very inexpensive and it comes in a wide array of sizes with the 51 ounce model being it’s largest size. The Brazil is very affordable because it is truly a base model. It is not insulated, it’s made with lots of plastic, and it uses the simplest of filtration screens. Although you won’t get the best quality coffee from this coffee press you won’t spend much so it’s worth buying as an entry level model or as an occasional use item in your kitchen. This french press has a capacity of 51 ounces, making it one of the largest models from any Bodum line earning it a place in this list. This model can prepare 12 cups of coffee, which is the ideal size for a moderately large family gathering or group gathering. All these things combine to make it worth going for at the end of the day. You can see pricing for the 51 oz Brazil french press right here. 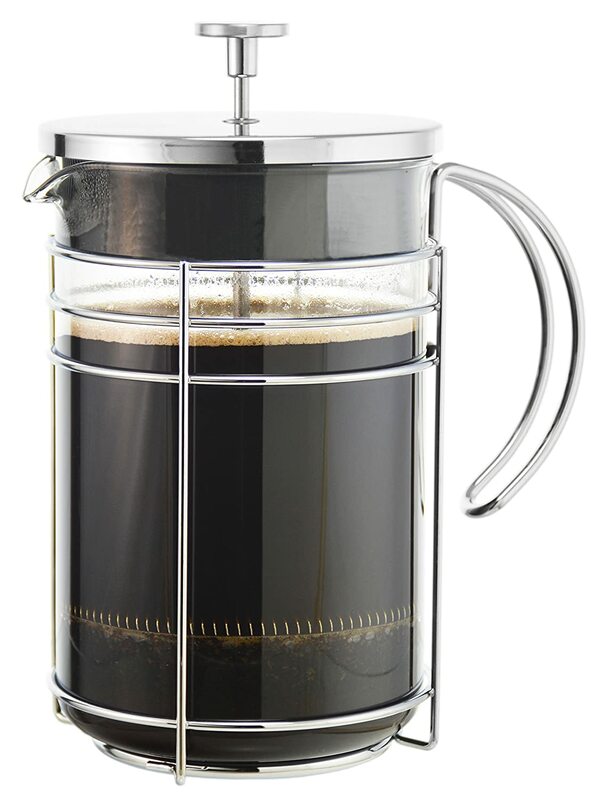 And then comes the 50 ounce (1.5L) French press from Secura. 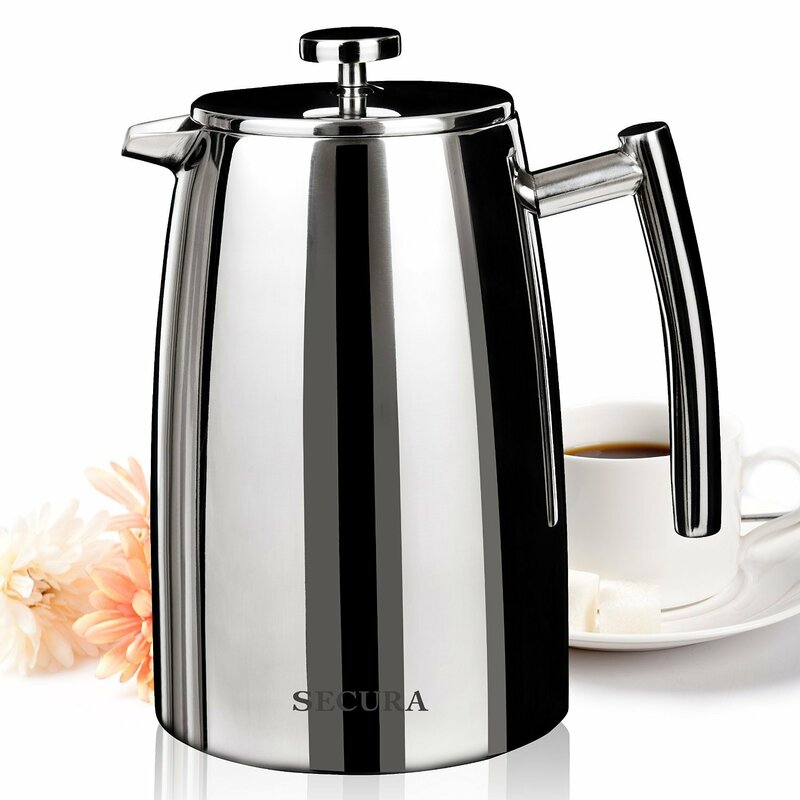 The Secura Stainless Steel French Press has a distinct look that sets it apart from competitor models of this size and while this look is different, it’s still kind of the same on the inside which is why I call this an entry level french press. In many ways this model is very similar to the Sterling Pro featured at the top of this page. It has a stainless steel insulated body that adds to the good looks and makes it really durable at the same time. It also uses stainless steel throughout making it a plastic free coffee maker but the steel seems slightly less durable than the Sterling Pro and because it’s slightly smaller we feel it’s appropriately priced lower and better as an entry model. There is nothing particularly novel about it’s plunger and filter so if you want a cleaner cup then you’ll have to add extra filter screens to the plunger on your own. Even still, for people price sensitive or for those who are fine with 1.5 liters rather than 1.75 liters this french press should be big enough to get the job done for a good price. Pair this up with a manual french press coffee grinder and you’ve got a match made in heaven! You can see pricing on the 50 ounce double walled Secura french press here. A little higher on this page I reviewed the Bodum Brazil, it is the entry level bargain model. The Chambord would classify as the next level up in the as it’s not as basic or cheap but I wouldn’t classify it as luxurious either. The Chambord is better though. It uses no plastic on the plunger meaning it is more durable and your coffee does steep in contact with plastic. The filter screen is still a regular filter found on lower quality press pots but it does perform slightly better since it uses stainless steel connections. I also like the Chambord because its easy to replace just the beaker or glass carafe in the case that it breaks and it’s still very low priced compared to some of the other larger and more expensive options featured above. 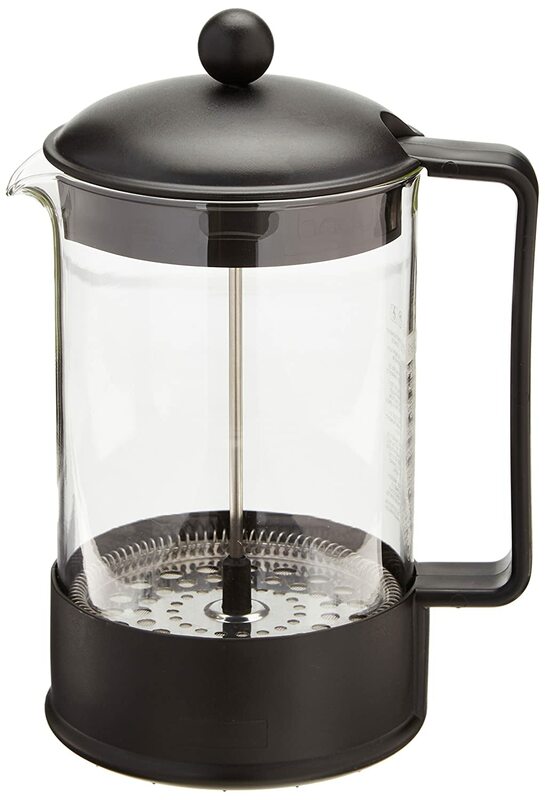 Most people will find the Chambord stylish too so if you care a lot about aesthetics then you get good value buying this over the other large coffee press options. 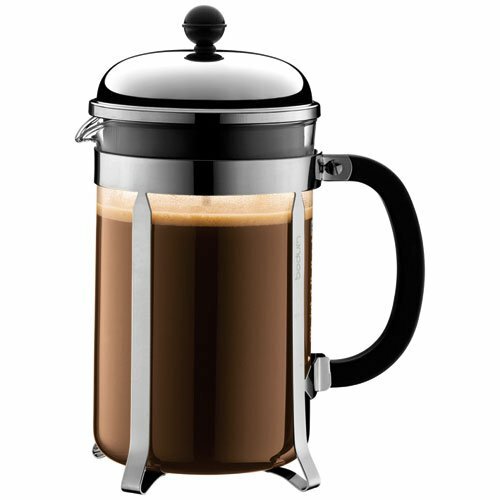 Even in this larger size category the biggest Chambord french press is still quite affordable. I recommend it for people on a budget that don’t want so much plastic in their coffee maker. You can see pricing for the 12-cup Chambord french press here on Amazon. Grosche Madrid makes some mighty fine glass french press pots! This one is their largest offering at 1500 ml or 51 ounces in size. I typically prefer insulated press pots because stable water temperature results in better tasting coffee but at the larger sizes the glass coffee presses don’t lose as much heat as the smaller one’s so insulation isn’t quite as important. This coffee press is premium in my opinion because it uses almost no plastic in it’s construction at all and because the entire plunger can come apart easily for cleaning, the beaker can be replaces if broken, and because of the styling of the coffee press. This model is not really any better than the Chambord featured above but it is more expensive mostly due to style and thickness of the glass carafe. If you want something that looks awesome then go for this over the Bodum Chambord otherwise you could easily save a few bucks and get the Chambord instead. The one thing I don’t like about this press considering it’s higher price tag is that its filtration screen is kind of typical to what you’d find in a cheap press pot. 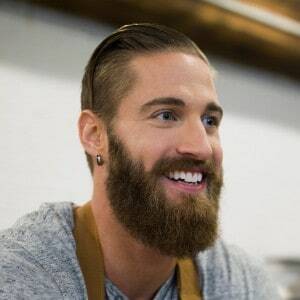 If you think having a cleaner cup of french press coffee is important then you’re probably paying too much for this model. For people that don’t mind a little “body” in their cup and you are willing to pay up a bit for premium style then by all means check this out, it’s a big step up from the Bodum Brazil for sure. Pricing for the largest Grosche Madrid coffee press is here an Amazon. 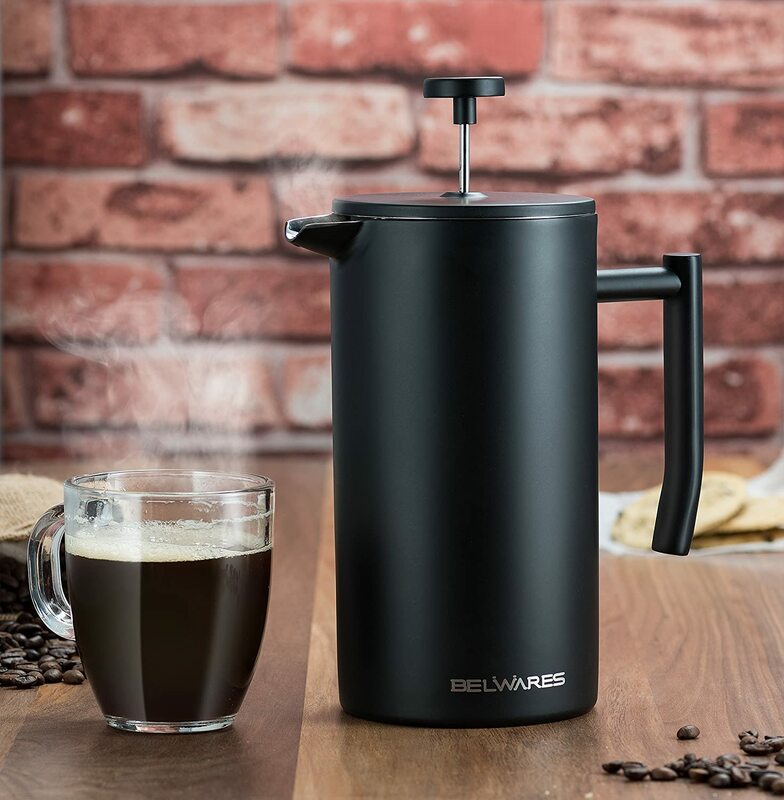 And let’s finally conclude the list with the Belwares 50 Ounce French Press Coffee Maker. This 1.5 Liter coffee maker is yet another model that is a clone of the Sterling Pro but at a lower price and in a different color, pewter black. This model also has a 18/10 stainless steel body that’s both beautiful and really durable at the same time at a very affordable price. In my opinion this is one of the models that you simply have to consider if you’re opting for a moderately large French Press Coffee maker. I like that this coffee press uses stainless connections, is well insulated, and looks different than many of the other “normal” stainless steel versions which are silver. Really, this model is almost a carbon copy of the Sterling Pro so if you don’t mind the relatively unknown brand name on the label this will be a great way to get a huge french press in your kitchen for a very small investment. You can check current pricing on the Belwares 1500 ml coffee press here. Editor’s Note: We are advocates for having multiple coffee presses because they are so affordable. If you are so inclined you should also take a look at our list of best french press travel mugs and our list of dual filter coffee presses. The above list of french presses was compiled based primarily on size. I don’t believe the press pots on this list represent the best models made but for customers who are shopping based on this feature being their primary point of interest I wanted to cast a wide net of large coffee presses to choose from from various price points. Once I curated my list of largest coffee press I then took other important features into consideration. Insulation & Durability: Insulated french presses are simply more durable than glass beaker styles. They don’t break as easily and they brew coffee at a consistently high temperature whereas glass carafes will start brewing much hotter than they will finish at four minutes later. Many stainless steel double wall models contain far less plastic than the glass carafe styles do and that also improves their durability over time. Quality of the Plunger & Filtration: The next most important aspect of french presses in my opinion is the quality of the filtration plunger. Most cheap coffee press plungers use a single filtration screen attached with plastic to the plunger handle. The screen is a micro mesh steel screen that stops coffee grind from getting through but usually the side walls are the weak spot and some grind and fines will leak into your coffee from between the screen and the glass side wall of the carafe. 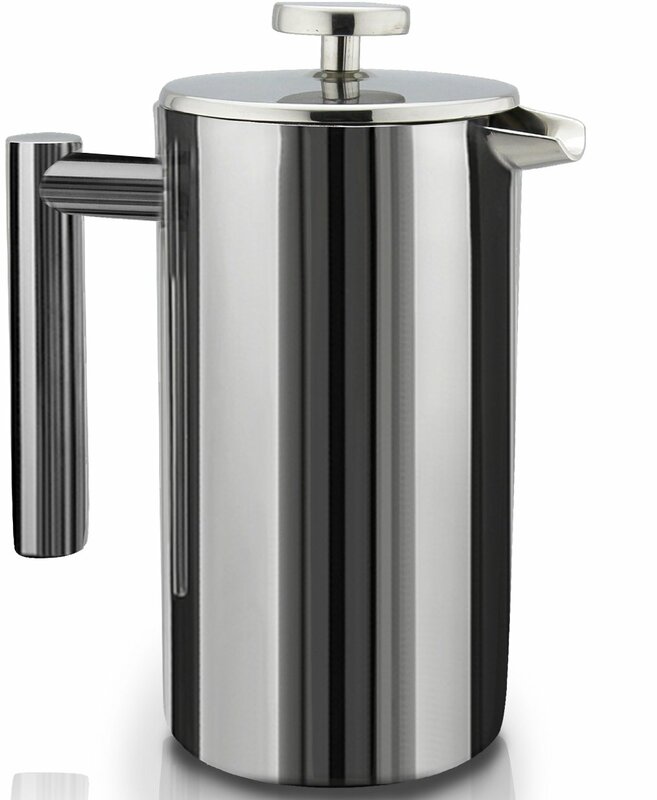 The best french press coffee makers will use a stainless steel connection between the screen and the plunger handle improving durability and causing less flexion of the screen as it presses down. Some models will come with extra filtration screens that press more tightly against the side walls resulting in a cleaner cup of coffee. Still other premium models utilize patented special filtration screens that have in some cases tighter woven mesh, tighter silicone side wall seals, or one-way valves that keep water away from the grind once it is filtered out. Every upgrade to the filter screen and plunger results in better coffee but these fancier plungers come at a price. Pricing & Value: The last main point of consideration has to do with the price. I’m not talking lowest is best either. I’m saying that the price needs to justify the quality of features you are either getting or not getting. If you get a glass carafe french press that uses a lot of plastic in it’s construction and comes with a basic filter screen then you better not be paying very much for it. With every upgraded feature the price should climb. In some cases all you may want is a base model that gets the job done but if you plan on using your coffee press often then paying a bit more is worth it so long as you are actually getting a better model that makes better coffee and will be more durable. See this page for my reviews of the best french press travel mugs on the market. Now, let’s take a moment to address some of the most common questions we get from customers looking for the biggest french press coffee makers on the market. Some customers are quick to make selections and others have a few questions before they pull the trigger. Here are a few answers we have prepared in response to the most common queries we get from people looking to buy a big coffee press. Why would I need a large French press coffee maker? Hmm, it’s a really great question. As we discussed earlier in this article, you might have a big family or a big group of friends. Maybe everyone is simply in the mood for having some extra coffee. You might even want to just make some coffee once and keep it available for the rest of the day (since most of these French presses are sort of insulated too). So, there can be any number of reasons why you might need a larger model, it’s entirely dependent on you. Aside from the capacity/size, not really. The whole mechanism is the same, it’s only the size that’s different to suit different needs. Actually, that’s one of the things that I was concerned about as well. But there’s no reason to worry because most of these models actually do have insulation. While some are better than the others (the ones providing you with double wall or vacuum insulation), almost all of them generally have at least some insulation. Given the fact it’s a large pot, it’s bound to have a minimum level of insulation, so there’s nothing for you to worry about. How much should I be willing to spend? Once again, this entirely depends on you. Everyone has different budgets and as such you have to understand how much you can spend for a large French press coffee pot. Just keep in mind that you don’t exceed your budget. At the end of the day, all the models listed above and a few others are all at least 50 ounces, enough to make a bunch of cups of coffee no matter how big you pour them. I think its important to buy the best quality product you can afford in most cases but if you don’t plan on using your press pot very often then I wouldn’t push anyone to spend very much money; the base Brazil would do just fine. If you plan on brewing coffee very often in your french press then it’s definitely worth spending more on a nicer model, possible the Secura listed above or the Sterling Pro. GBC is always here trying to help educate our customers about coffee, its various brewing methods, and the countless coffee recipes that you can try. We also help curate products and help our customers find exactly what they are looking for so we sincerely hope we helped you today. A large french press is great for making a lot of coffee at once but they are terrible if you want to brew only a single cup. If you haven’t considered getting a small french press to pair with your big one then at least check out our article on the best small french press coffee makers for sale today.